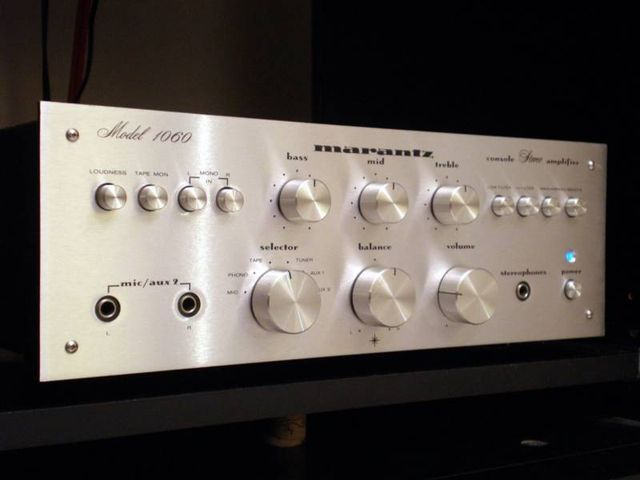 This time the story is, a while ago I got a Marantz 1060 from the mid 70s, sold a while after when I moved to a different home. There is something euphoric on this amps, I very well know that is just distortion and coloration from a an early design being picked by my brain as a lush velvety sound I can listed for days. The true is that I have missed it to bits ever since. So, recently I got another 1060 on that auction site. It’s very clean and 99% original, the volume pot which was replaced at some point but it serves the purpose and will be easy to source the original. This 1060 sounds so cool to my hears to a point I don’t want to recapped. This is a nonsense but the trues is that I don't want to touch it. A recap will certainly change things a bit, maybe for better but that's not the goal in this case. I experienced a different flavor when I recapped the the bigger cousin 2270, especially after I hit the preamp-tone board. 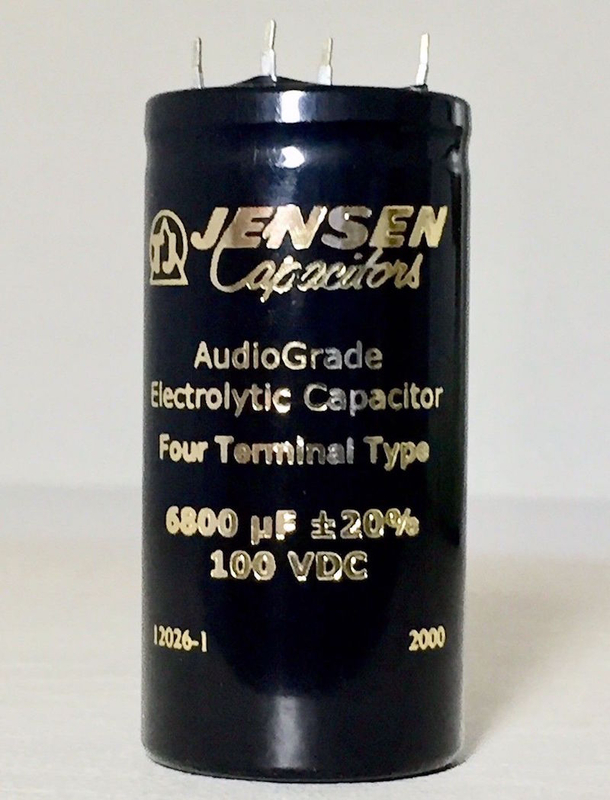 I do actually intend to keep the values close to original, with the exception of the main filter capacitor, I am bumping from 4700uf to 6800uf just because I found a Jensen 4 pole for half the price. These for pole caps look a bit more tricky to wire but I understand that the + from rectifier goes to the "+ in," then the the amp board wire comes from "+ out." All the ground wires go to "-in," and the "- out" goes to that ground strap", seems easy. The coupling caps will remain 3000uf (original) or 4700uf max because the physical size matches existing braces, planing to use Jensen here as well. In addition to main filter and coupling, on the first approach, I will also replace all electrolytic on power supply board and all the local power supply filters, I have used Elna Silmic II on my 2270 but looking for something different and cool probably "Audio Note Kaisei lytics"... as they are inspired on the famous Black Gates, these are found in several pieces of Parasound gear and i dig that sound. No advice, but I enjoy your tinkering projects, so I'll be following along. Of course, I'm curious to hear the AB comparison results, because, yes, I've heard conflicting perspectives on recapping these lushy old Marantz units. There're a couple of them here -- but they're kind of tired. 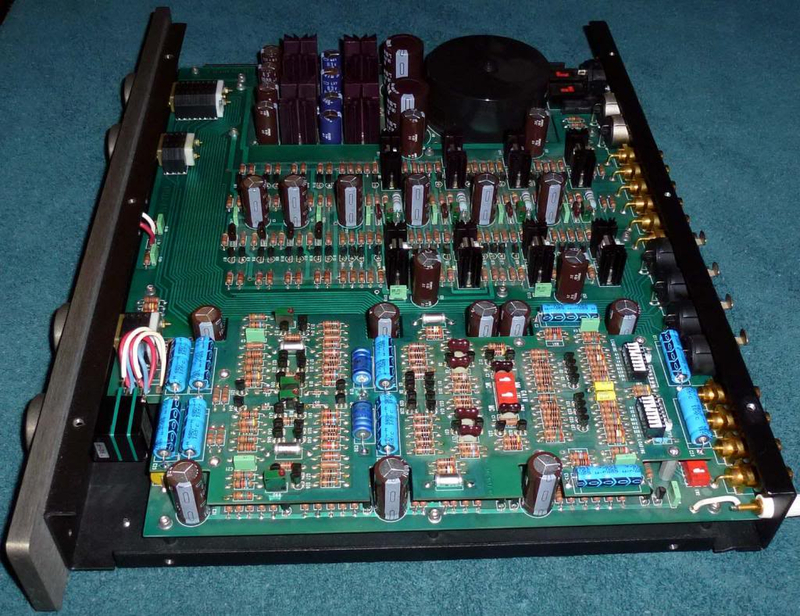 Or a semi-complementary cap-coupled amp like an HH Scott 260/LK-60B. This is something I am curious about! Does it output that much DC that you need AC coupling? My discrete output DAC I/V stage has common mode DC. For those who don't know, common mode is DC between balanced ground and negative balanced, and ground and positive balanced. (DC can be nulled between pos and neg balanced). Enough DC that it will shut my old Krell KSA-250 down. I chose to run with balanced ground lifted rather than run couplers. Scott complimented my pretty semi when I was excited over my tired transformer coupled capacitor output amp. Yeah, it doesn't have a fully differential amplifier -- both halves of the push-pull outputs ride on one side of zero volts DC, so there is a significant DC offset on the power transistors' output. 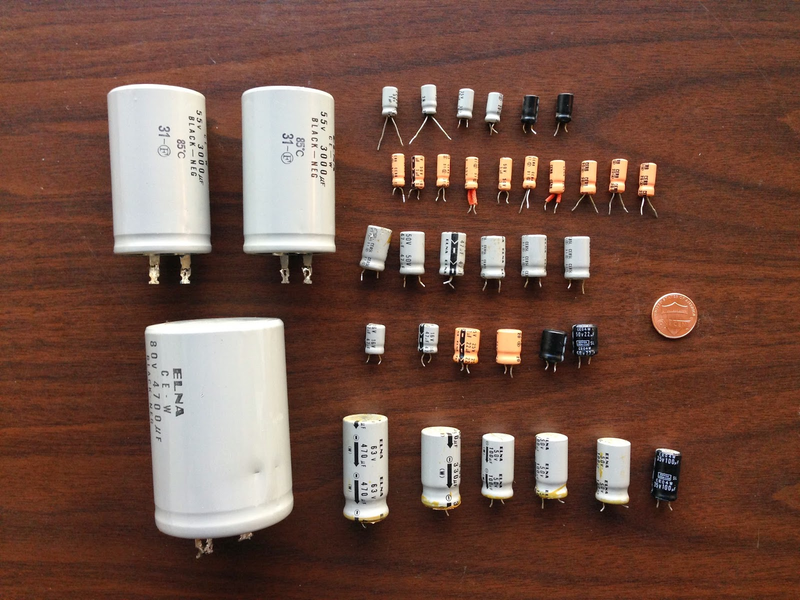 The filter capacitor removes the DC. It's a pretty brute force approach but it was necessary in the early days of transistor amplifiers (due mostly to technological limitations of making transistors). EDIT: Later cap-coupled amplifiers represent a design with a single DC output from the power supply -- which, arguably, may have been done to manage costs(?). The "cost" of the coupling capacitor, of course, is a limit to the LF response of the amplifier (which is probably pretty negligible with a large value coupling cap) and frequency dependent phase shift above the cutoff frequency for the cap coupled circuit. I imagine that the square wave performance of a cap-coupled soiled state amplifier is pretty ugly -- but I don't know that for a fact. wrong there, and the plate voltage (several hundred volts DC) goes to the speakers. Oy. Why do they put so danged many electrolytics in them dang soiled state amps?! The second across the top looks like she might be more....accommodating. 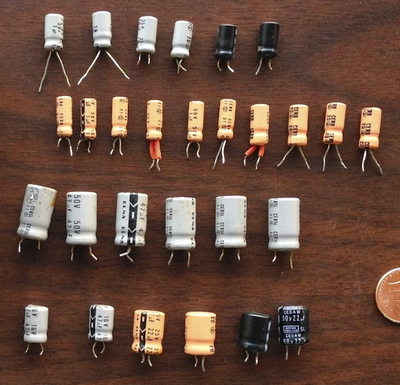 I know youse guyses are really looking for the bipolar capacitors -- not that there's anything wrong with that. Yes, I have downloaded the service manual. There's a ton of very useful restoration threads and very knowledgeable folks willing to help threads on AK as well. ^^^ Not bad stuff at all -- even that late in the brand name's long (and somewhat checkered) legacy! Yep, even their soiled state receivers had a very tube-ish sound to them, and powerful. The old stuff, newer stuff was dumpster diver material. 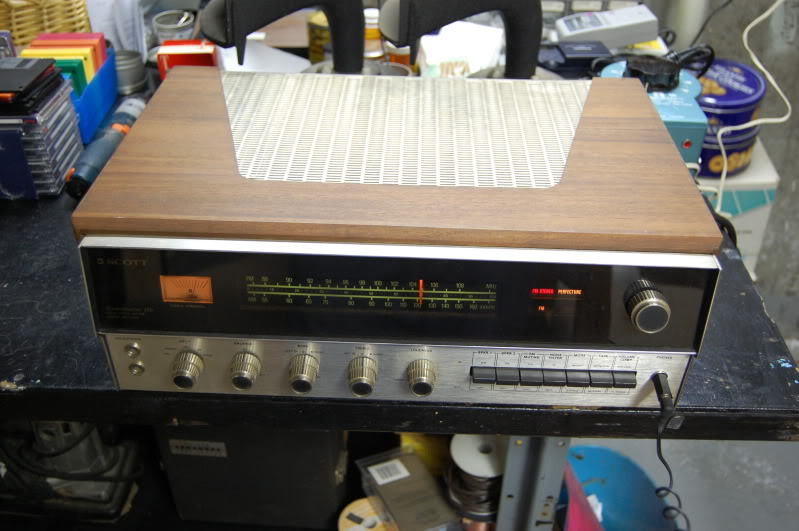 That vintage sound, like the older Marantz's, Sansui's, Scott.....very addicting. Not the most transparent or detailed sound, but pleasurable to listen to for hours on end. Makes one wonder why we keep chasing this higher end banana in audio. 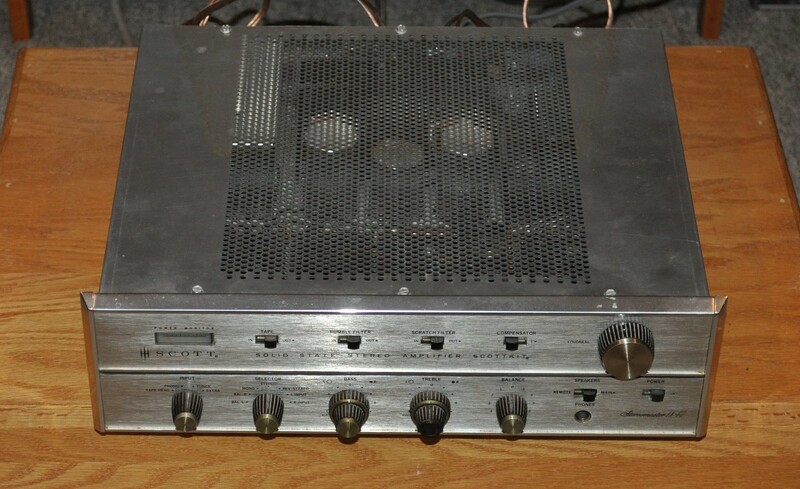 They should just remake these amps and receivers using the old schematics but with newer Caps and Resistor options. Kind of like what Volkswagon did with the BUG. I like the newer bugs design a lot too. I did actually have the discipline to pass along a couple of ss Scott receivers to others (believe it or not)! 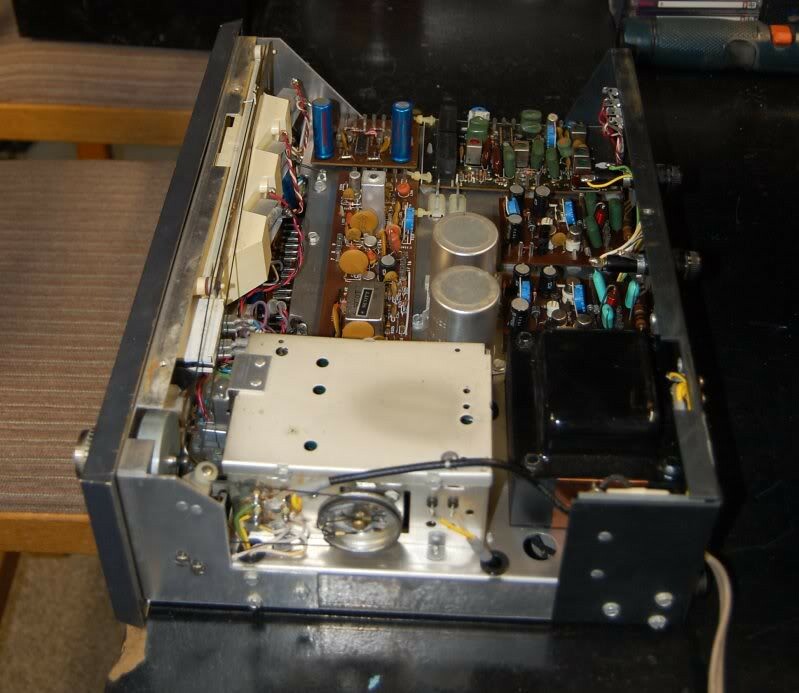 Early ss hifi was built sort of like vacuum tube hardware, with socketed transistors, e.g. "Modular" construction was also a fad (TVs, too) -- these Scotts are relatively "modular" -- and very nicely built. 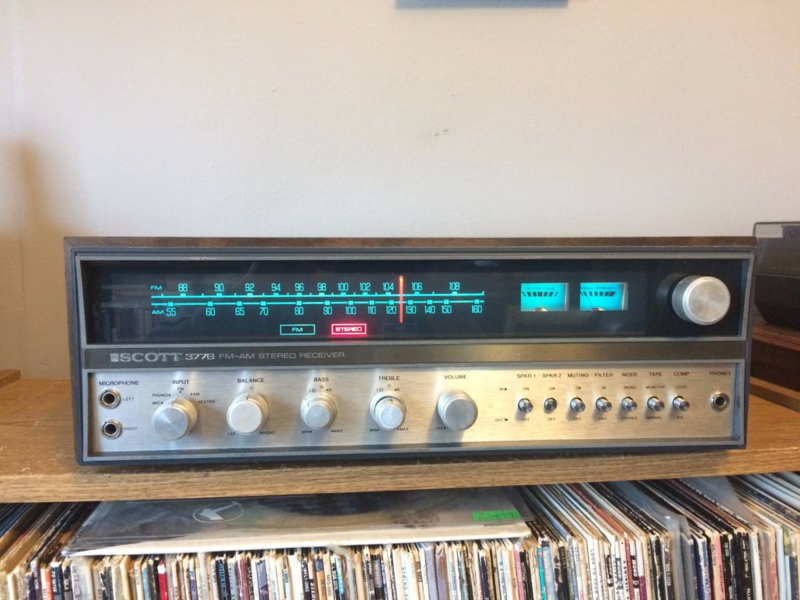 The FM tuners in all three of those early, US-made HH Scott receivers are excellent by any standard (audio- and radio-wise). 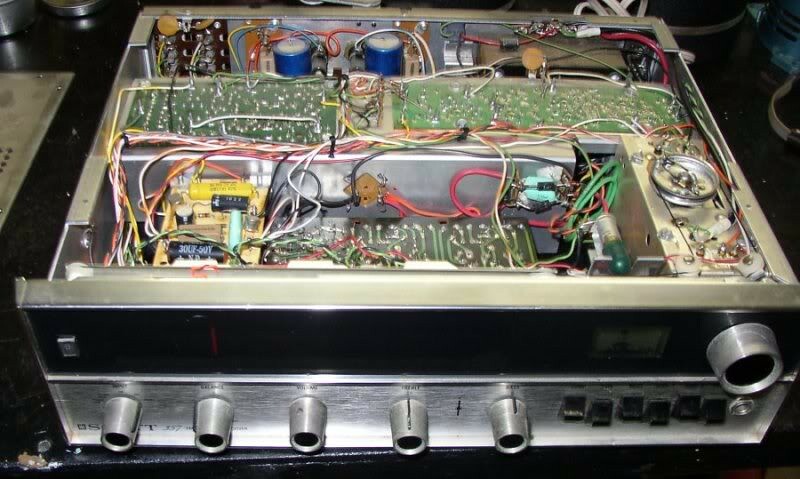 People go really nuts restoring this old amps, almost everything with exception of a few critical parts as output transistors and some film capacitors. I have seen circuit board replicas getting re-populated with all new high-grade components. "I don't get why they aren't built like this anymore. It seems that consumer's trend now is to have convenience, extra features and seeking to upgrade gear every couple years in lieu of and longevity..."
You think consumers like buying gear every few years ? It's called built in obsolesce, and just about every maker of consumer goods has caught that bug. Can't make too much money by selling a product that last 20 years. That's why vintage is in demand and some sink good coin into refurbishing them. They may last another 20-30 years. To make something like that, today, you'd pay 3-4-5 k for. The higher end stuff today is built pretty good. I always suggest to look at yesterdays high end stuff, Like B&k, Classe, Cary, ML, Proceed....their outdated processors and their amps are pretty darn good. 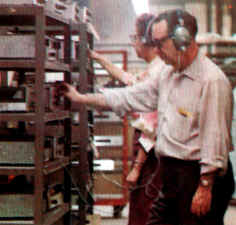 Ya have to remember too, much of that vintage sound we all like, came from using all those vintage transistors, caps, etc. When you redo these things, they may lose some of that luster. Only thing you really can do is replace with the closest values you can find. 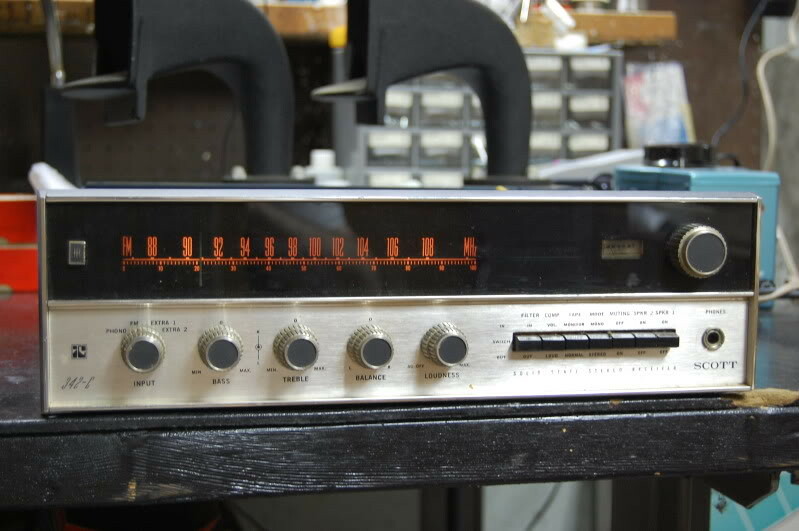 I've read up on a lot of vintage threads in regards to refurbishing these old receivers/amps. Lots of good suggestions for brands that best match that vintage sound. Google up your specific brand and model, the internet is great for some things. When I recapped a Marantz 2270 it ended up sounding pleasant, but definitely not the same I sound I recall before capping. I can make sound closer by twinking the tone controls but it's not the same when Bass, mid and treble is set at noon. 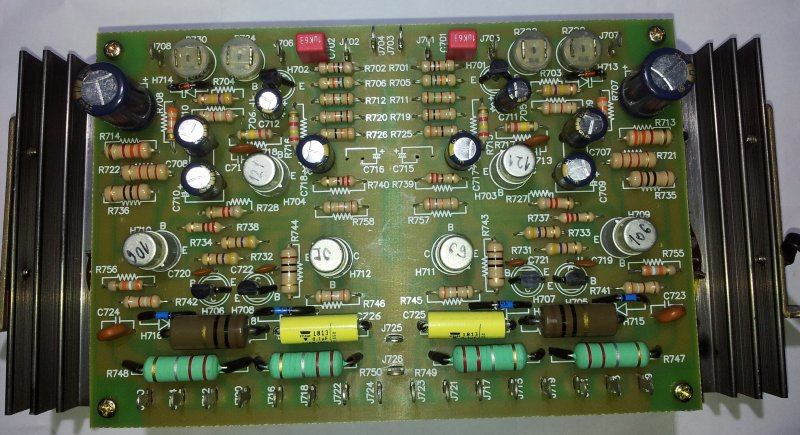 Nostalgy apart, some original components have a specific voice that adds to that typical 70s Marantz coloration thing, replacing them with correct value and voltage may not do it. 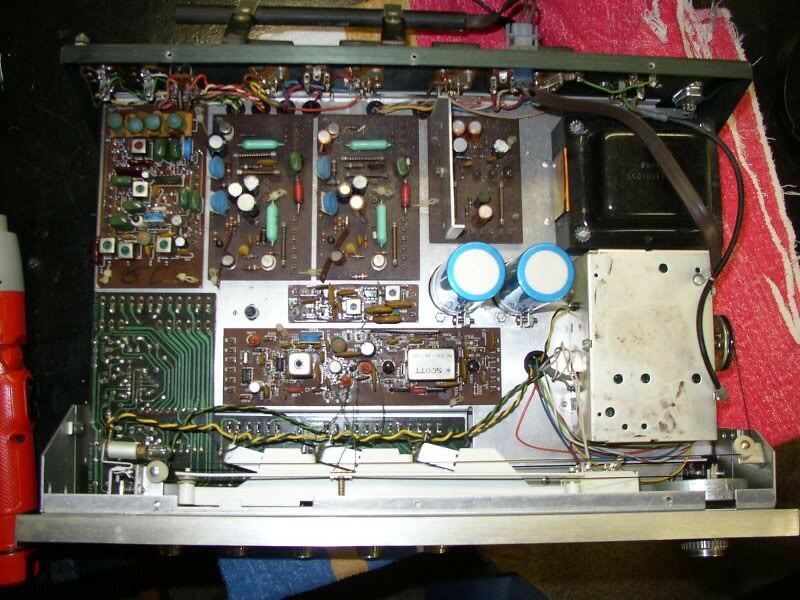 Without wanting to digress, guitarists are way more conservative than Hi-Fi hobbyists, the procedure is regrated by the principle "it is not broken don't fix it" no one will ever think of replacing original tone capacitors those noisy brown carbon comp resistors on a vintage guitar amp as they contribute to its mojo. It would be interesting to AB the unmolested 1060 vs recaped 1060. Yeah...too modern lookin and the put the engine in the wrong end and also made the wrong end the drive end...ugh. That Krell layout look pretty clean, though!